Lately, each consecutive summer in NYC seems to top the last in offerings of outdoor film screenings. Locations range from parks, to restaurant backyards, to rooftops and even beaches. And now, the concept is extending into the fall with an additional twist: a drive-in. 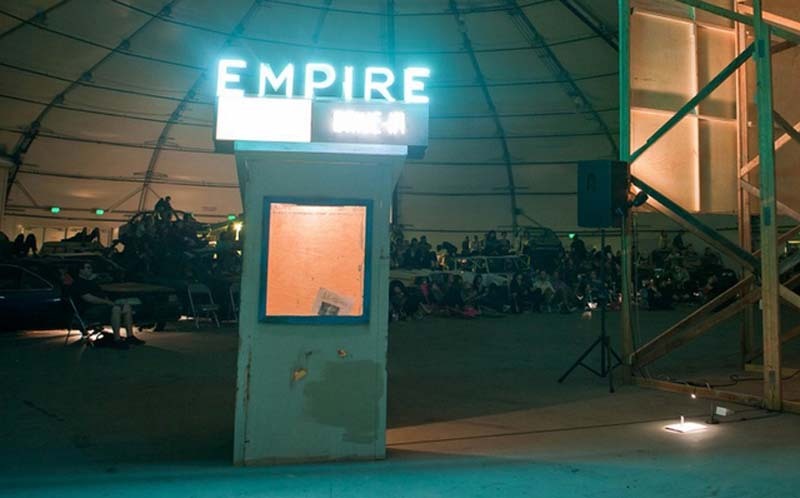 Not just your usual run-of-the-mill drive-in, which in itself would be cool and intriguing enough, but Empire Drive-In is a junk car drive-in, upcycling wrecked cars rescued from junkyards and repurposing them as seats for audience members to climb into, and onto, while watching films projected on a 40-foot screen made of salvaged wood. The masterminds behind the project—which will be held outside the New York Hall of Science in Corona Park, Queens, starting October 4th and running though the 20th—are Jeff Stark (whose name seems to be associated with many an interesting NYC event) and Todd Chandler. 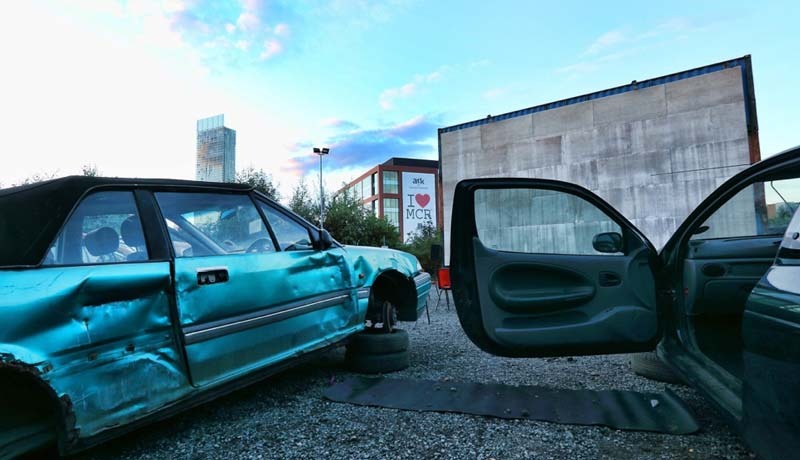 The two Brooklyn-based artists have previously created other Empire Drive-Ins, most recently last year at the Abandon Normal Devices Festival in Manchester, UK. Stark and Chandler, along with a team of other artists and craftspeople have set out, in this age of consumerism, to create a sense of possibility by focusing on re-use, designing something new and special while salvaging and repurposing waste. In cleaning up the cars, which will have stereo audio transmitted via radio directly to each car, the crew found all kinds of interesting personal artifacts from car deodorizers to letters, which they have chosen to keep in the cars to “create a story”. The audience is urged to explore. Opening night promises to be fun with a 30-Pianists-on-Casio-keyboards performance, in addition to a stellar line-up of films from Buster Keaton, Charlie Chaplin, and Oliver Hardy, to Jim Jarmusch’s Night On Earth. You can see the rest of the schedule here. This entry was posted in Architecture, Event, Film, Fun, Industrial Design, Interaction Design, Just Plain Cool, NYC, Pop Culture, Stuff We Like. Bookmark the permalink.